Student absenteeism is never an easy topic to discuss. However, discuss it we must because when a student is away from class, it impacts everyone – the individual student, the class, the teacher and the school. There’s a delicate balance when we start talking about students being away from school. Sometimes it’s sickness and we definitely want you to keep your sick child at home from school. We know you have to get to work and your child may or may not want to come to class – but we, along with the office staff, are really unable to look after sick children. Your children would actually prefer to just be at home with you recovering from their sickness and then building up the strength to return to school to be full and participating members of the class. The other families in your child’s class, and us, the teachers, do not want to get sick. Your support in helping your children understand that they cannot come to school when they are sick, teaches them to have respect for their own health, the health and well-being of their classmates, and one day, their working colleagues. You can read more here about Your Kindergarten Child’s Good Health. Currently, our icy and snowy weather and road conditions have made it difficult for some families to arrive at school on time. Add to that our limited parking spots around the school and it can be an exercise in frustration to run in before the bell. However, when your child arrives consistently late for school, and by this we mean 3-4 times a week, he or she misses out on the first routines of the day which are essential for setting the tone in the classroom. The first bell rings at 8:50 am when children are welcomed into the school building. We sing “O Canada” immediately following the 8:55 bell, listen to the school announcements, then take attendance. Finally, we review the Visual Schedule; this helps the children with their self-regulation so they know what to expect and may reduce anxiety about “what’s going to happen next?” The Special Helper, with a friend, start to walk to the office with the attendance. These morning routines take us about ten minutes so there is ample time to get into the classroom. Because it’s Kindergarten, we still give you a lot of leeway: if your child comes in after we have finished the attendance, but before the Special Helper has left for the office, then we will adjust the attendance form to say your child is “here.” Any later however, and your child is marked absent. 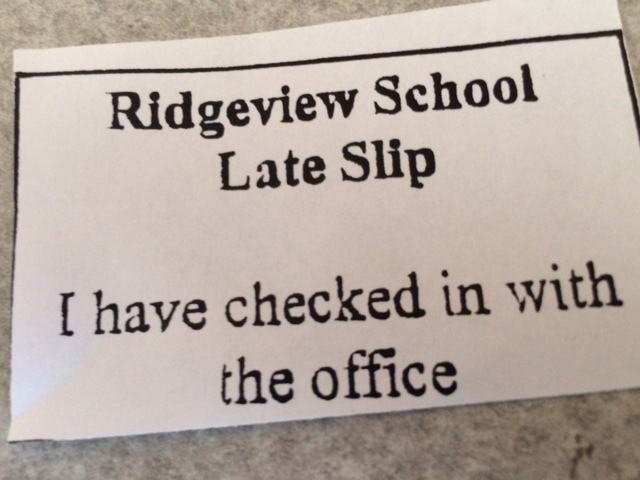 You need to sign your child in at the office when you arrive at school and your child will be given a late slip. Another consequence of being late for school is that teachers need to stop our teaching, or helping a small group or individual, to greet the late arrivals, tell them where we are in the morning and help them to get settled. We also need to remind you that you need to check in at the office if your child has arrived without a late slip This is disruptive to the other students, particularly when we’re teaching the whole class, and the “flow” of the lesson is affected. We understand when you come in late from a dental or doctor appointment; but those are usually infrequent as most of you make them for later in the school day or have given us notice the previous day so we are prepared. If you are going to be late, please call the school office. Our parent organized school callback line and administrative staff have to phone you, and follow-up with us, when you have not notified them. If you do not remember to sign in your child when you arrive, then the school office must call down to our classrooms looking for your child. We do all of this for the protection of your child so please help us by doing your part. The other morning, while watching the news, there was a preview of the men’s golf tournament taking place in Kapalua, Maui. You could just feel the heat and sunshine. With the way our weather has been this winter and less expensive flights during the off-season, many of you will hear the siren call of palm trees, tropical breezes and hot sand beneath your feet. While missing two weeks of school is not really ideal, we also understand the need for families to reconnect and bond; and frequently for some that can only happen when they travel. We recognize the importance of family time and creating life experiences with grandparents and other relatives, and that travel is its own unique learning to become a citizen of the world. We can only speak from our perspective as Kindergarten teachers, and the influence of our own personal and professional life experiences. However, the common understanding we do have with other grades is that we are unable to make up the work your child misses while on holiday. We’re often asked if we could “prepare the work my child will miss while we’re on holiday.” Kindergarten is a difficult grade to send meaningful work along with you. Our read-aloud stories and the class discussions which follow are powerful for the oral language and shared learning that happens among the students. Children are learning their alphabet sounds from the teacher and building vocabulary collaboratively with their peers. When children are working on their number patterns and number centres, they are .using masses of manipulatives that have been specially created or purchased for them. Much of a student’s learning is meant to happen in a larger social context, in addition to an individual one. As parents, we can create a special activity for our family while travelling. Pack an empty notebook, a small set of scissors, gluestick and fet pens in a ziploc bag and you have all the materials you need to create and write an amazing travel journal. Everytime you go sightseeing, pick up stickers, postcards and brochures and save all your admission tickets. Take some time each evening to reflect on what you did during the day and together, print a few notes about what was your favourite activity and cut and paste in your postcards and brochures. Don’t forget to save one of those cute tourist maps for reference. We know you’ll be taking lots of pictures. You can leave some space for adding a few photo when you get back. If you work on it everyday, on your last day of travel you’ll have a memorable souvenir that your child can bring to school and show the class upon your return. And while you’re visiting the tourist and gift shops, browse through the children’s book section. When we travel, we always look to see what interesting children’s books, specific to our holiday locale, are available for purchase. A book to read from your holiday destination is another great momento to bring home. So, snow, sickness and holidays aside, school starts at 8:50 am tomorrow! We’ll see you then.